Home Personality How Introverts Stand Out From the Rest of the League? In 1921, the pre-eminent psychologist of his times, Carl Jung had come up with a book named ‘Psychological Types’, which acquainted the readers with the terms ‘introvert’ and ‘extrovert’ as the two main personality types. Since then a lot has been done to understand these two worlds that co-exist but are ruled with marked differences. Picking up the topic of introverts or more precisely ‘introversion’ is imperative to understand the depths of the lives of the people who are stigmatized as ‘shy’, ‘weird’ or ‘devoid of basic energy levels’. In fact, Jane Austen describes the thinking of introverts something like this:- “I wish, as well as everybody else, to be perfectly happy, but like everybody else, it must be in my own way.” I am sure these lines uttered by Austen provide a different perspective against the myths that have been carried through the ages. Why not walk down this lane where the introverted population lives and find out some essential key-points that do justice to the question ‘How Introverts Stand Out From the Rest of the League?’. 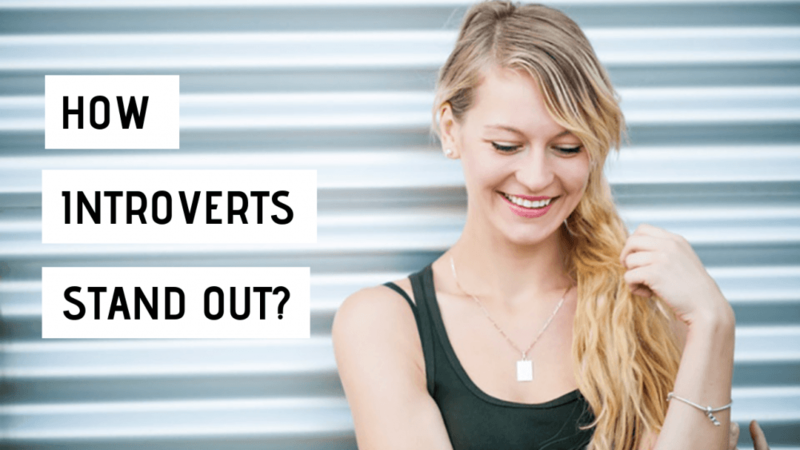 A further read of this article will saturate your mind with all the main aspects of the introvert personality that makes them stand out from the rest. Being alone may not be the first preference of many individuals. The reason is really simple to understand. Man is a social animal and we have been taught to live in groups to experience the feeling of fulfillment. As such, the tendency of the introverts to have a great time alone seems to challenge this basic principle of survival. This is what makes introverts an exceptional class of people who is courageous and bold in its own choices of solitude. The gift of solitude that they have is an eye-opener for them that provides them with an opportunity to grasp their stream of thoughts and creativity. Individuals who are more chirpy and can begin small conversations instantly are generally liked by the people. This is because small talks do not challenge the thought process of the people and tend to appear more acceptable. On the other hand, the introverts are too much inclined towards a deeper communication with their chosen friends or closed ones. They love the intensity in everything and look to things that may remain unnoticed by the other people around them. The act of innovation needs good observational skills and an increased level of imagination. Introverts have both in plenty which allows them to give birth to innovation for the better of the mankind. The introversion facet of the personality of Bill Gates could be the cause behind his well-known invention ‘Microsoft’ that revolutionized the technological world. You must have been through the phase when your teachers told you to maintain pin drop silence and then focus on your learning. This instance unfolds the value of silence. In the moments of serenity and peace, the human mind works with finer accuracy as the concentration power gets accelerated. Introverted people are well introduced to the potential of silence in allowing them to gain complete control over their minds. Self-reflection is also an award of silence that is a must for improving our lives. This message is circulated to each of us by the introvert population for sure. The sense of being truly independent is a true virtue that everyone aspires for, especially in the present times. People want to make important decisions about their lives without relying on somebody. This instills in them the most loved quality of freedom for which even wars took place in history. Introverts are one step ahead in exposing themselves to independence. Since they prefer to be alone most of the time, they only look up to themselves for solutions. This ensures that their nerves are loaded with a strong vigor of self-reliance. Today, when everybody is in a speedy race to establish his theories and points of view above that of others, there is an urgent need of people who play the role of listeners and empaths. Thanks to the introverts who have mastered the art of listening and empathy. A likeness for sensitivity and a potential to feel the emotions of others makes a good connection between the introverts and the people in pain. Therefore, most introverts are automatically seen as healers, healing the wounds on the surface and deep within the living. Though introverts seem to obtain their energy from the world that is inside them, it cannot be denied that their observing competence is far much developed from the other people. While the people most commonly ignore what is happening in their surroundings, the introverts capture every moment and draw conclusions from them. This satiates their thirst for knowledge as well as transforms them completely into individuals who relate to bigger pictures and things in life. Before you know the world around you, you need to know yourself. Yes, self-awareness can solve all your dilemmas, plus give you an extra advantage when faced with adversity. A complete realization of one’s own self motivates a person to take the right actions with minimum chances of getting defeated. When the whole picture about your own personality takes a transparent shape, all the hurdles are cleared up when you even just stand up with yourself. The prominent painters, writers, artists, scientists, musicians, etc. in all the chapters of different centuries were the lovers of seclusion. This is what accomplished them in their respective fields and persuaded them to leave benchmarks that could not be erased by the winds of time. Art is a profession that cannot be operated among the crowds of people. Being a solitary activity it blooms best during the hours of excellent ‘Me Time’. Now, this also sets the introverts absolutely apart from the commoners. The lives of introverts demand a space for gathering all their deep ideas and fantasies. Among all the everyday gossips and superficial living, we definitely require people who can uplift the status of the society with positive contributions towards it. All the progressive minds with different approaches and standpoints should not be only labeled as geniuses but should be given ardent respect for sharing this insightful attitude with us. Mark Zuckerberg, Albert Einstein, Isaac Newton, and J.K Rowling very perfectly fit into the category of the introverts. They have proved that their orientation is the reason for their bountiful growth which places them in the highest order of the human race. This is indeed impressive! Sonali Sharma is a BSc (Medical), graduate. She has a fine interest in Psychology and writing. She has been a regular blogger for several websites.